Hello, March! 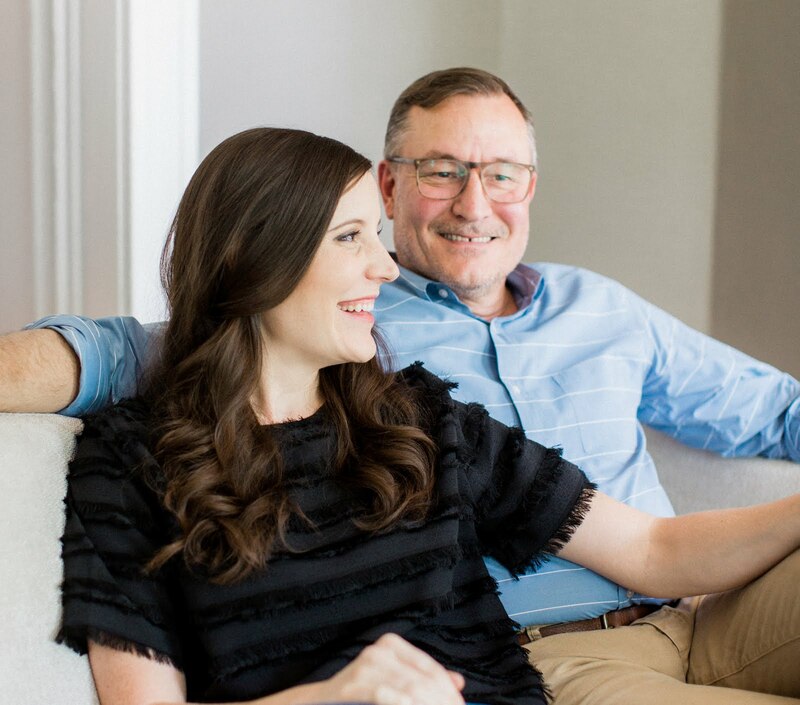 This time of year we're always itching to start planting seeds and get outside in the garden (plus, reading about all the plants you're excited to grow this season in the comments section of Tuesday's post has only intensified the feeling). Since the weather has been significantly cooler in our area and we've been out of town for long stretches, we're planning to get started a little later than we have in the past (March instead of February) — so today we thought it would be fun to round up some of our favorite garden themed images from across the web as inspiration for getting a little dirty when we return home. Because we have limited outdoor space, we're always trying to think of creative ways to make use of vertical space and love experimenting with a wide variety of edible landscaping. I'd say we're looking forward to planting many of our old favorites (greens, peas, tomatoes, herbs and all sorts of peppers) but are most excited to try out a few new plants like hungarian peppers, cucumbers, lavender and perhaps a fruit or olive tree. We're also looking forward to cultivating the return of our perennial plants like strawberries, grapes, horseradish and turmeric roots. We've talked for years about getting or better yet, making a rain barrel — hopefully this will be the season we make good on all our chatter. 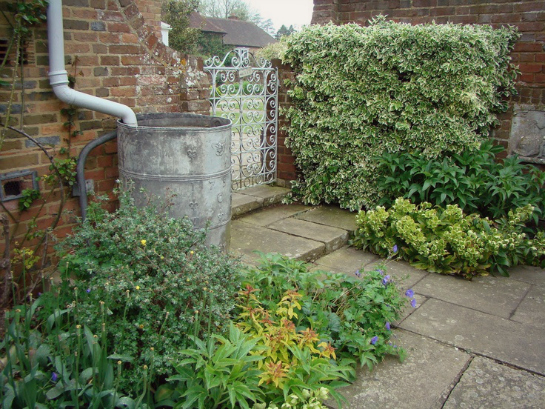 We love the way this brick enclosure above feels like a bit of a secret garden and the rain barrel fits in seamlessly. 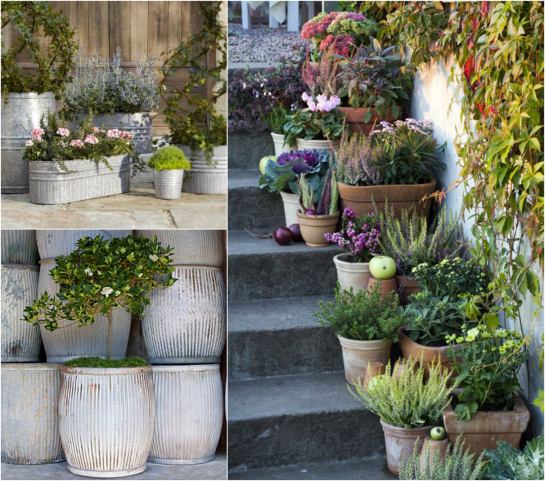 Garden planters: staircase container garden, galvanized tub planters, vintage zinc barrels. 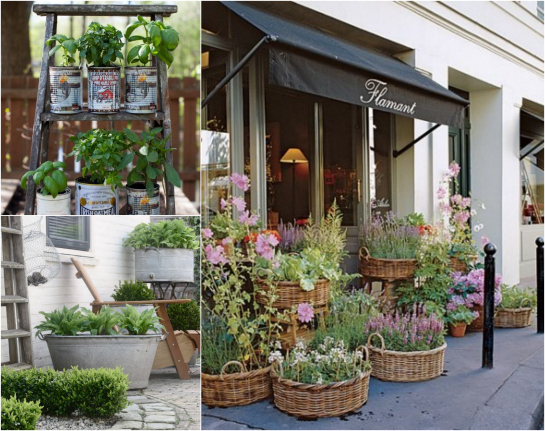 Recycled planters: upcycled can planters, galvanized planters, basket planters. We've always had fun starting spring peas and experimenting with ways to grow them vertically in our limited space. We've tried bamboo teepees and even flipped tomato cages upside down to create a similar effect. Don't the natural trellises and teepees below just look dreamy? We're looking forward to getting creative with pea supports again this year, something we'll probably tackle in the next couple of weeks. 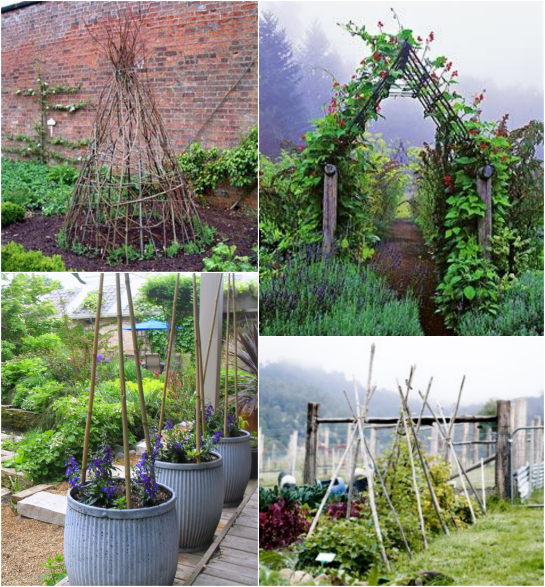 Vertical pea supports: sweet pea supports, courtyard obelisk, planting cage, vine obelisks. Supports are so great for using up vertical space and have worked really well for us in the past — plus they just add a bit of an alluring architectural element to garden spaces we love. 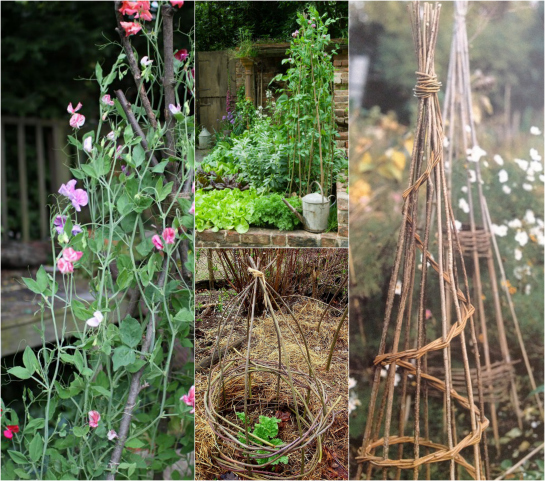 Natural supports: garden salvage wigwam, bean arbor, bamboo container obelisks, branch teepee supports. Speaking of supports, we'd love to try growing cucumbers this year, but lack the space for a vining plant. Looking at the supports and contained planters for cucumbers below gives us the needed inspiration to take a stab at cukes of our own this year. If you'd tried it with success, we'd love to hear your tips! 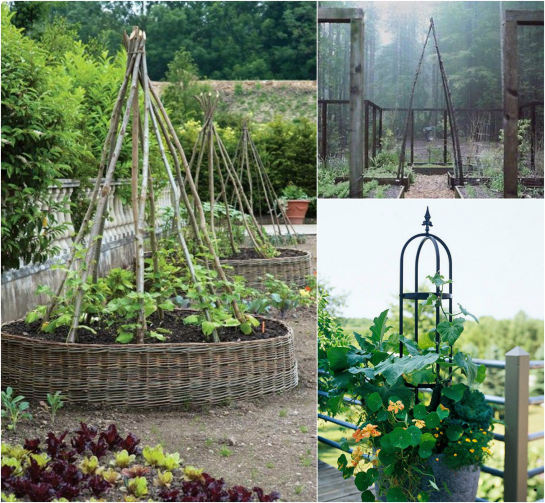 Vertical cucumber supports: raised bed teepees, garden bed dome, cucumber trellis. 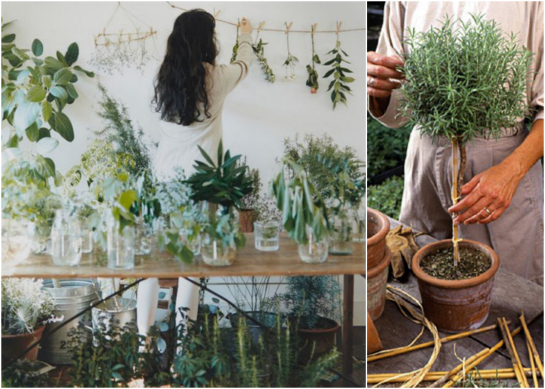 Growing herbs: propagating plants, rosemary topiary. 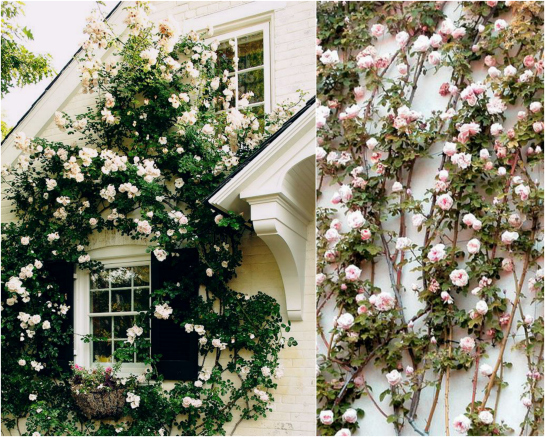 Climbing roses: white roses, pink roses. While we're talking about plants climbing the walls, fruit trees are something we'd love to venture into with our garden. Our neighbor has a large fig tree in her yard that we have access to each year, but we'd love to mix things up with more fruit bearing trees. We'd never seen the vertical "flat" growing method for fruit trees below — isn't it fascinating to see how a plant as strong as a tree can be trained to grow in any sort of space? 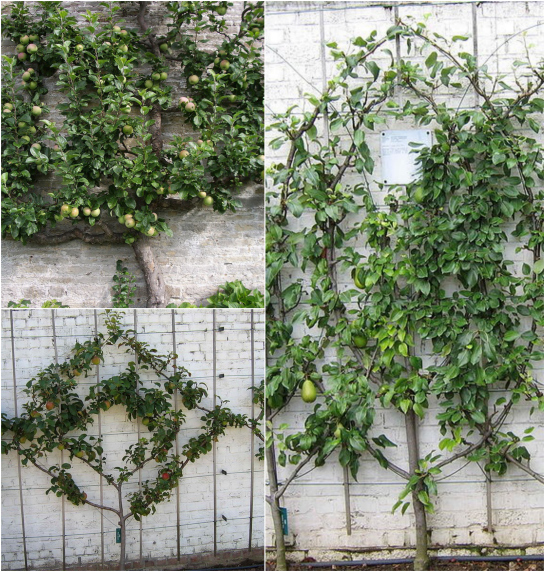 Wall Trees: espaliered apple tree, fan espalier tree, pear cordon fruit tree. 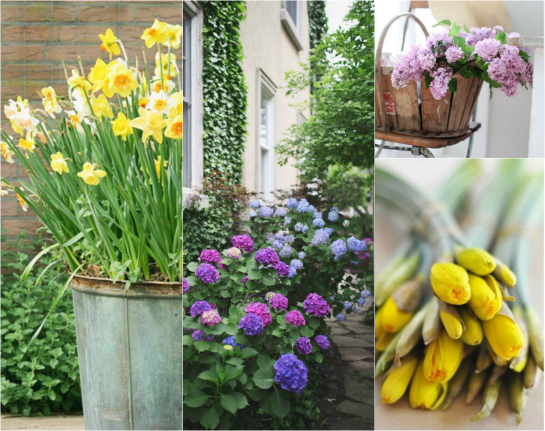 Spring Flowers: potted daffodils, hydrangeas, lilacs, daffodil buds. 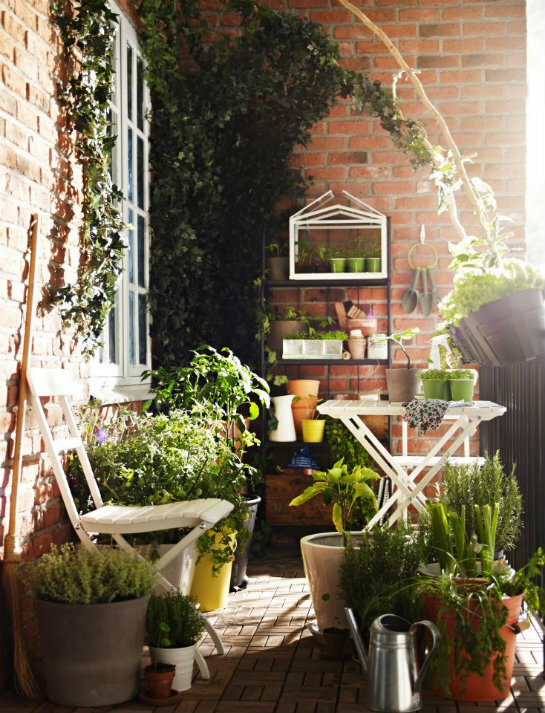 We'd love to know — what are you excited to plant this growing season and do you have any go-to growing tips for small or vertical spaces? Keep up with more of our garden inspiration by following our "In the Garden" Pinterest board. this is a garden image feast! i love every bit you found! The flat growing trees is called "espalier" if you want to look up "how to." It works with grapes too. I went to a talk on container gardening yesterday and one of the best hints I took away was to layer pot - a very large pot on the ground with another pot on top of that soil, but off center a bit, then as many more pots as you want or have going up on top of each other - each is planted with it's own plants (herbs, maybe?) or all the same combos to make it look like a huge tower. To keep it from tipping, run rebar through each pots soil and through the hole to anchor it to the pot below. I can't wait to try this!